In 2015, the eminent German publisher, Steidl faithfully reproduced a catalog Noah Purifoy himself fabricated with photographs and writings in a 3-ring notebook in 1997. At that time, he wrote this introduction. For a limited time, Noah Purifoy Foundation is pleased to offer a copy of this catalog as a thank you to donors of $100 or more. Hannah Collins' arresting B&W images of the Noah Purifoy Outdoor Art Museum captures her experience exploring Noah's desert floor sculptures. The publication references Walker Evans' 1966 photographic study Message from the Interior in its format and formality. The wide-ranging and socially conscious works of renowned California artist Noah Purifoy are explored in this illustrated monograph. Noah Purifoy made art in order to enact social change. Created mostly from found objects, his neo-Dadaist sculpture both embodies and reflects the environment in which it was created--whether the burnt ruins of the 1966 Watts Riots or the unforgiving climate of the Mojave Desert. Published in conjunction with Purifoy’s highly acclaimed exhibition at Los Angeles County Museum of Art, this book follows Purifoy's remarkable life and career. Purifoy transitioned from high-end furniture designer to assemblage artist, social worker, arts administrator, and finally creator of a desert art museum. Illustrated throughout with works from every stage of Purifoy's career, this volume also includes essays by acclaimed curators, critics, journalists, and fellow artists--all champions of this profoundly thoughtful sculptor whose work has been under-recognized for far too long. The pioneering work of a group of black artists is documented in this companion volume to the groundbreaking exhibition that was part of Pacific Standard Time, an initiative of the Getty. This comprehensive, lavishly illustrated catalog offers the first in-depth survey of the incredibly vital but often overlooked legacy of Los Angeles's African American artists, featuring many never-before-seen works, some of which were previously considered lost. Now Dig This! features artists including Noah Purifoy, Melvin Edwards, Fred Eversley, David Hammons, Maren Hassinger, Senga Nengudi, John Outterbridge, Betye Saar, and Charles White, and others, connecting their work to larger movements, trends, and ideas that fueled the arts during this important era of creative, cultural, and political ferment. The publication also explores the significant network of friendships and collaborations made across racial lines, while underscoring the influence that African American artists had on the era's larger movements and trends. Now Dig This! Art and Black Los Angeles, 1960-1980 is part of Pacific Standard Time, an initiative of the Getty. This comprehensive, richly illustrated book explores postwar American art from a new perspective: Southern California. The analysis of the L.A. art scene from the end of World War II until the beginning of the 1980s―the first in-depth scholarly survey of the region's art―demonstrates the major role Southern California artists played in the twentieth century's most influential art movements. Grounded in more than a decade of research, the five chapters augmented by lively sidebars take readers on a tour of an art world in constant formation. The story unfolds through the people, relationships, and ideas that defined the region's artistic production. Purifoy’s involvement with the Watts Towers Arts Center, and in particular the new salience he found in the discarded objects and debris following the Watts rebellion, and the 66 Signs of Neon exhibition Purifoy and Judson Powell put together are extensively chronicled in chapter two. Photographs and rare materials from the Getty Research Institute and other archives bring the era to life. L.A. Object offers a historical overview of the Los Angeles assemblage movement of the 1960s and 70s. It focuses on works by primarily African-American artists often omitted from mainstream gallery and museum historical exhibitions who were working during the civil rights movement, the 1965 Watts riots and the era's general social and cultural upheaval: Ed Bereal, Wallace Berman, Nathaniel Bustion, Alonzo Davis, Dale Brockman Davis, Charles Dickson, Mel Edwards, David Hammons, Daniel La Rue Johnson, Ed Kienholz, Ron Miyashiro, Senga Nengudi, John Outterbridge, Noah Purifoy, Joe Ray, Betye Saar, Kenzi Shiokava and Timothy Washington. Central to this book are the unique body prints of David Hammons--ironic, often political commentaries relevant to the African-American experience that are presented for the first time within the context from which they arose. Tracing the development of abstract painting, assemblage art, and efforts to build new arts institutions, Cándida Smith lays bare the tensions between the democratic and professional sides of modern and contemporary art as California developed a distinct regional cultural life. Men and women from groups long alienated—if not forcibly excluded—from the worlds of "high culture" made their way in, staking out their participation with images and objects that responded to particular circumstances as well as dilemmas of contemporary life, in the process changing the public for whom art was made. Beginning with the emergence of modern art in nineteenth-century France and its influence on young Westerners and continuing through to today's burgeoning border art movement along the U.S.-Mexican frontier, The Modern Moves West dramatically illustrates the paths that California artists took toward a more diverse and inclusive culture. Special attention is given to Sam (Simon) Rodia, an Italian laborer and tile setter, who created an elaborate assemblage in the backyard of his home in Watts, California. The result was an iconic structure now known as the Watts Towers and adjacent to where Purifoy co-founded the Watts Towers Art Center in the same spirit of inclusiveness. From postwar efforts to end discrimination in the motion-picture industry, recording studios, and musicians’ unions, through the development of community-based arts organizations, to the creation of searing films critiquing conditions in the black working class neighborhoods of a city touting its multiculturalism—Black Arts West documents the social and political significance of African American arts activity in Los Angeles between the Second World War and the riots of 1992. Focusing on the lives and work of black writers, musicians, filmmakers, and visual artists—Noah Purifoy, David Hammons, Betye Saar, Judson Powell, and others—Daniel Widener tells how black cultural politics changed over time, and how altered political realities generated new forms of artistic and cultural expression. His narrative is filled with figures invested in the politics of black art and culture in postwar Los Angeles, including not only African American artists but also black nationalists, affluent liberal whites, elected officials, and federal bureaucrats. Samella Lewis has brought African American Art and Artists fully up to date in this revised and expanded edition. The book looks at the works and lives of artists from the eighteenth century to the 21st century, including new work in traditional media as well as in installation art, mixed media, and digital/computer art. Noah Purifoy, Edward Berreal, Betye Saar, John Outterbridge and others are featured in the chapter on mixed-media assemblages. Generously illustrated, the book continues to reveal the rich legacy of work by African American artists, whose art is now included in the permanent collections of national and international museums as well as in major private collections. In this engaging book, Cécile Whiting examines what Pop looked like when it left the highbrow cloisters of Manhattan’s art galleries and ventured westward to the sprawling suburbs of Los Angeles. She finds that the artists who made California their home in the 1960s created in their works a new and different sense of space, the urban experience, and popular culture. Whiting shows how artists such as Vija Celmins, Llyn Foulkes, David Hockney, Dennis Hopper, Allan Kaprow, Claes Oldenburg, Ed Ruscha, Noah Purifoy and Judy Chicago helped to shape the identity of Los Angeles as an emerging art center, while avoiding in their representation of the city the clichés of both its boosters and its detractors. A chapter is devoted to the Watts Towers as an urban landmark. Delving deep into the southern California aesthetic sensibility, Pop L.A. recounts how the artists transformed the image of the city in works that focused on the ocean and landscape, suburban life, dilapidated houses in aging neighborhoods, and more. The common bond of place, for Whiting, gives coherence to the varied experiments in the visual and performance arts that altered the cultural terrain during this pivotal time. This catalog was published by the California Afro-American Museum Foundation in conjunction with Purifoy's traveling retrospective exhibition Noah Purifoy: Outside and in the Open. 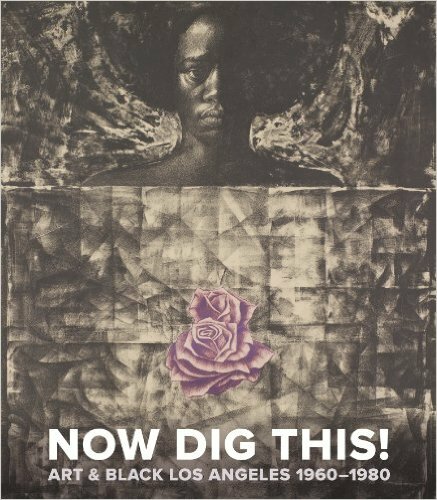 This seminal show opened in Los Angeles at the California African American Museum in 1997 and traveled to the African American Museum on Dallas, Clark Atlanta University Art Galleries, and to the Oakland Museum in Oakland, California, introducing Purioy's work to art-goers outside of Los Angeles.